Today is my lovely husband's Birthday - his 30th no less, so I wanted to make him something extra special, foxy special. If you are a fan of the Simpsons then you too may have seen the episode with the lemon tree and remember Homer shouting at one point that he was "Cunning, like a fox!" Well for some reason everything is ..... like a fox! 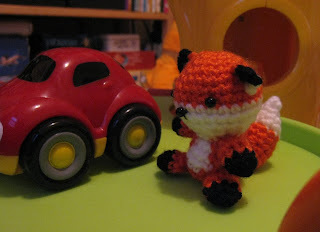 for my husband (he has been "sleepy, like a fox" and "hungry, like a fox" even "Ferocious, like a fox") so I've been toying with the idea of making him a fox for some time. 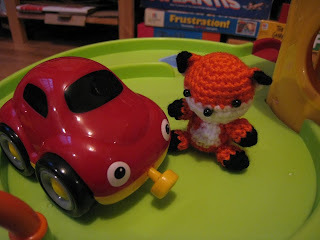 Then I came across the fantastic blog tiny owl knits by Anja who makes the most perfect Amigurumi that I've ever seen and I fell in love with her tiny fox. Unfortunately she was at that point no longer selling copies of the pattern for her fox and so in desperation I sent her a message asking if she minded my trying to make my own fox based on her photos. She then very kindly sent me a copy of her pattern for free and I was able to make up this fox from the great instructions in that. If you too would like to make yourself one of these exceptionally cute foxes then you will be happy to know that she is now selling the pattern again as a Ravelry download so head over there now and buy yourself a copy of it. I can confirm that the fox is very cute. Just wanted to point out the Homer Simpson is "Stupid like a fox". I tried to find a clip on youTube but it looks like Fox(!) have mopped them all up. that fox is so cute !!! the husband is sure very lucky. Oh my goodness, this is way too cute! I just love your little fox to pieces!